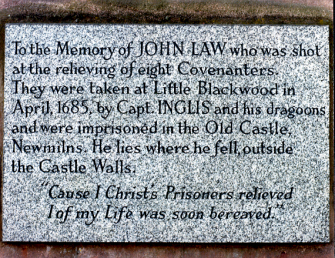 John Law was shot whilst trying to escape from Newmilns Tower, where he was being held prisoner. He was buried in the tower garden. John Law's memorial is a modern granite slab, affixed to the front wall of the parish church. It copies the first half of the inscription from a stone panel attached to the wall surrounding Newmilns Tower.